Home Care Sheets & Guides Do Goldfish Need an Air Pump? Do Bubbles Help Them Breathe? While many factors come into play for goldfish care, one of the most important is making sure they have enough oxygen to breathe. There are several ways to keep your tank properly oxygenated, and we’ll touch on all of them, but the main focus of this article will be on the all important question: Do goldfish need an air pump? Using an air pump in your aquarium is the easiest method to help your goldfish breathe more easily, but there are other benefits as well. Read on to discover the importance of using an air pump and some of the benefits it can provide to you and your fish. How do I Know if My Goldfish Have Enough Oxygen? How Does Oxygen Get Into The Water? Is an Air Pump Right For Your Goldfish Tank? How Do I Know if There’s Too Much Circulation in My Tank? So, do Goldfish Need an Air Pump? Just because goldfish don’t have lungs, doesn’t mean they don’t need oxygen to live. As a matter of fact, they need LOTS of oxygen. Goldfish are a very active and busy fish, swimming and foraging all day. They need a lot of oxygen to fuel this behavior. Goldfish take water in through their mouths, then the water passes over an organ called a ‘rake’, where oxygen from the water is absorbed into the bloodstream and used to keep cells and organs functioning properly. The water is then expelled, along with carbon dioxide, through the gills. Are your fish gasping for air on the surface of your fish tank? Are their gills moving faster, and more pronounced than normal, as if their breathing looks labored? This is likely a lack of oxygen. Are they hovering around your pump trying to catch air bubbles as they rise? Are any bottom-dwellers you have spending more time in the upper reaches of the aquarium? Are your goldfish spending lots of time gulping at the surface of the water? Although natural behavior, they should only come to the surface infrequently so if it happens a lot, yes, the water needs more oxygenation. If you’ve already installed an air-pump, you might need to make adjustments to improve water circulation, or increase the output of bubbles. Or if you’re still trying to decide whether or not you need an air pump, any of these signs suggest that now is the time to take the plunge. In the watery wilds of the world – ponds, streams, lakes, and oceans ­- a strong current combined with a large surface area keeps the water moving enough to circulate it, allowing the water to come into contact with the air and keep it oxygenated. At the same time, carbon dioxide is released from the water and out into the air. This process all happens on the water’s surface, the only place where water meets the air. Obviously, an aquarium has quite a low surface area, and the oxygen/carbon dioxide exchange is often quite low. In order to speed up the process, you as an aquarium keeper must find a way to circulate the water and break the surface tension in your fish tank to increase the amount of oxygen and carbon dioxide being exchanged on the water’s surface. The best way to do this is with an air pump. The short answer is yes! An air pump is a positive addition to just about every goldfish aquarium and here’s why. Break the tension. Surface tension that is. A bubbler will disturb the water on the surface of your fish tank, making it much easier for the exchange of gases to take place. You’re adding oxygen directly to the water. While not as important as the oxygen/carbon dioxide exchange that happens on the surface, forcing oxygen bubbles into the water will still give your fish more oxygen to breathe. Moving water is good for your goldfish. Water at the bottom of a tank with no movement can become stagnant, with little in the way of nutrients or oxygen. When you move this “dead” water to the top of the tank, it will become oxygenated, making for a healthier tank and happier fish. Bubbles look good. Yes, part of the reason we keep fish in our living spaces is that we love the way they look! Nobody wants to gaze at a scummy tank for long, but an aquarium that is ripe with healthy fish and bubbly goodness? We can just skip the TV and watch the goldfish instead. Note: If you’d like to weigh up some options, check out our article on the best aquarium pumps! It’s far more common to provide too little oxygen than too much, but if you notice your fish being whisked around the tank or notice that they’re struggling to get around, you might want to adjust your pump so your fish have an easier time swimming. If you have small, slow, or weak swimming breeds in your tank, adjust the pump to provide large, slow-moving bubbles. However most goldfish are strong swimmers and can handle both small, fast-moving bubbles and curtains of air without any issues. 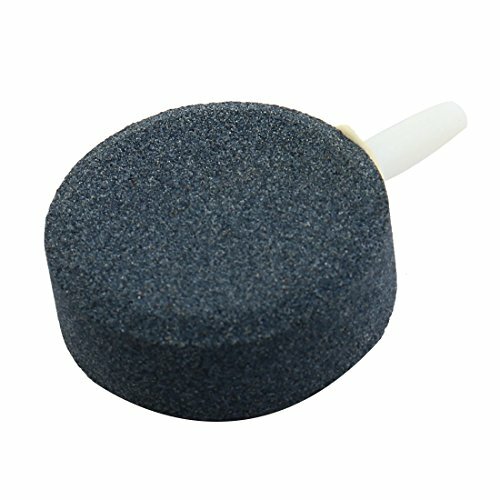 An air stone is simply a porous stone that you add to the outlet of your air pump inside your tank. When air is pumped and passes through the stone, it creates decorative air bubbles rising within the tank. They are available in a huge variety of shapes, sizes and styles, giving anything from wide but thin curtains of small bubbles, to large and wide areas of very big bubbles – and everything in between. Air stones certainly help aerate your tank, not because of the creation of extra bubbles (though this helps a little), but because the surface water is constantly being disturbed, the surface tension is continuously being broken by the bursting bubbles allowing for a greater exchange of gases. Secondly, as the air bubbles rise, water is pulled up along with them from the bottom of the tank, dramatically increasing water circulation. Finally, many aquarium enthusiasts – myself included – love the look of a wall of bubbles in the tank. It’s highly decorative and I think adds some class to an aquariums look. For these three reasons, Air stones are highly recommended! However, you should be aware that weak swimmers may have a hard time if the current caused by rising bubbles is too strong. If this is the case, just make sure your pump is adjustable and lessen the output a little until your fish are happy. I should also say that air stones and the pump do tend to be a little noisy. The pump especially creates an audible hum through vibration. You can remedy this by placing your air stone and pump on a little piece of sponge to dampen the sound a bit. I promise you this dampens the sound so much you will no longer notice it. The air pump and air stone partnership are the go-to way for adding water circulation and breaking surface tension in a tank, prime ways to increase oxygenation. But they aren’t the only way. Following are two more methods to increase the oxygen levels in your tank. These whimsical ornaments work in much the same way as air stones, but with a little extra flair. Think pirate ships that move around the aquarium, treasure chests, and waving skeletons. 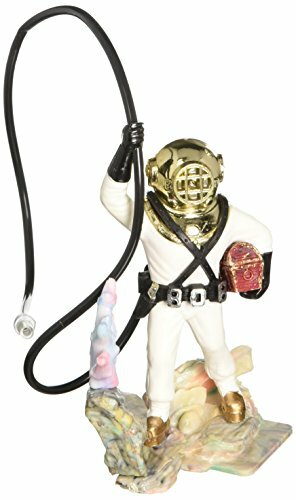 There is no shortage of fantastical ornaments available for your tank, no matter how big or small it is. You still need an air pump of course, but the stone is replaced with something a little more novel. Aerating ornaments will certainly help circulate the water in your tank. They may give your fish a place to hide out, and they will most definitely start conversations. If you want your tank to be unique and don’t mind deviating from a more natural look, aerating ornaments are a perfect fit. If you’re trying to make your aquarium look like an authentic and natural ecosystem, you will probably want to skip the aerating ornaments and go for live plants instead. There are plenty of living plants that will thrive in your aquarium, and many of them are easy to care for — just not as easy as artificial plants. Plants go through cellular respiration, just like fish, but consume and release gases in reverse order. Where a fish takes oxygen from the water and releases carbon dioxide(CO2) back into it, plants complement fish perfectly by taking in and using carbon dioxide while releasing oxygen back into the water as a by-product. A plant uses up CO2 exhaled by your fish, converting it into oxygen they need and releasing this into the water, while a fish does the reverse, using oxygen and producing CO2 for any plants. It’s a perfect relationship. Not only this, but growing plants use up ammonia and nitrates in the water, raising the water quality and allowing you more time between necessary water changes. If the idea of live plants in your tank is appealing, here’s a great resource for freshwater plant species to help you get started. Live plants provide shelter and food for your fish. They help keep the water clean and oxygenated and they are a beautiful addition to a natural water-scape. Live plants, however, aren’t always easy to care for. They often require pruning and specific light requirements, and they shouldn’t be placed too close to your air pump. If you’re ready to take your aquarium water-scape to the next level and are up for the challenge, give live plants a try. Yes, because sufficient oxygen is crucial to the survival and vitality of your goldfish. 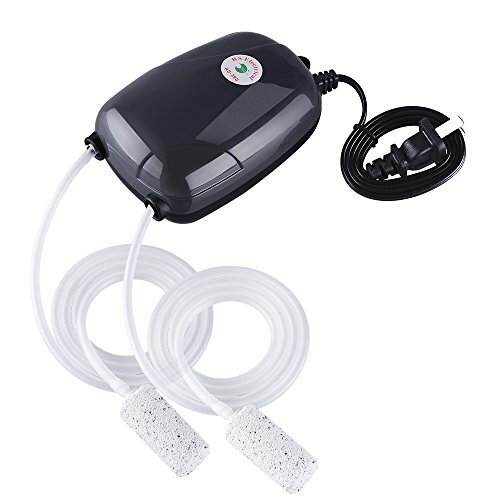 While there are many ways to ensure they have the oxygen they need to survive, air pumps are the easiest and most reliable for any fish keeper. An air pump will help you maintain high oxygen levels in your tank, keeping your goldfish happy and healthy so that you can breathe easier too. It could be a fungal infection, but it could be a number of things and without seeing, anybody would only be 100% guessing I’m afraid. so he’s a bubble eye? What type are the other fish in there with him? Bubble eye goldfish are very poor swimmers, poor sighted, and they should usually only be kept with fish of similar ability and problems, such as other bubble eyes, telescope eyes…any other slow swimming, poor-sighted types of goldfish. Otherwsie, they can be prone to being out-competed for food and be nibbled on by faster fish, sadly.